Two men wrap the boy within a white shroud and loop a red cord around his neck. Hushed onlookers draw closer. 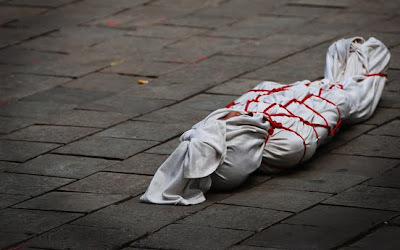 The shroud is knotted at the crown of the boy's head - the mark of the pocong. The red cord is looped around and around the boy, binding him in a net. He is still breathing. Pocong is a kind of ghost. Legend says pocong rises from the dead 40 days after being buried, if the death shroud is still too tightly wrapped around it. After burial, the corpse and the shroud should naturally degrade, allowing the soul to escape. If, however, the bonds remain fast, the trapped soul becomes pocong; leaping up from the grave, urging the living to loosen the binds and set the soul free. As the shroud encases the legs as well, pocong moves by jumping. Bound tightly, the boy is laid stiffly within a crude black tent. The crowd form a loose circle around the tent. 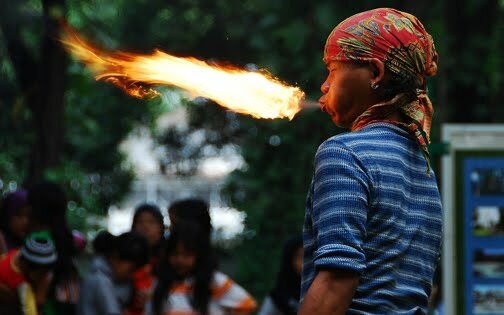 Suddenly one of the captors breathes a furious train of fire. He snatches up a long whip and cracks it against the black tent. The tent collapses and reveals...nothing. The red cord lies limp: the white shroud crumpled. The crowd gasp. The boy has disappeared. 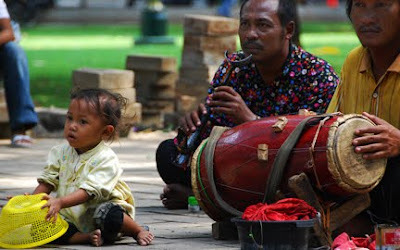 Catch the show in Suropati park, Menteng, Jakarta. Amazing! Where and how did you find this happening? 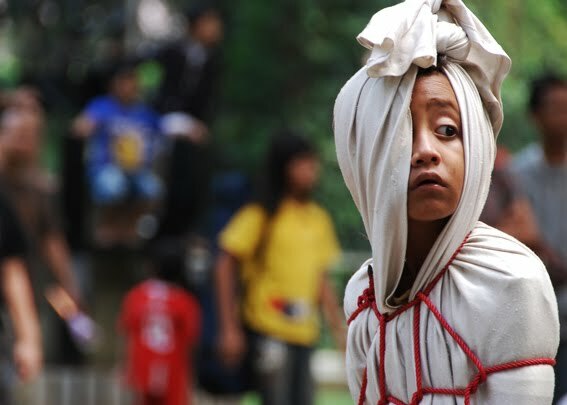 Stumbled across the pocong performance one Sunday morning in Suropati Park, Menteng, Jakarta. Had gone to see the weekly violin park orchestra practise and found these wild dudes as well. You just never know what's around the corner. ..
i think i saw a similar troupe in sunda kelapa once. A troupe regularly performs the Pocong show, Kuda Lumping, fire eating and acrobatic comedy at Fatahillah Square in Kota on Sundays.